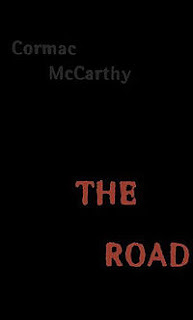 > Is McCarthy's THE ROAD as great as everyone says? The other day, at a flea market, I picked up a copy of Cormac McCarthy's 2006 novel The Road, which has been feted by critics and honored with a Pultizer Prize. I vaguely knew of it as one of those novels that relies on an sfnal trope--in this case, the post-apocalyptic setting--but which is absolutely not, no way, not at all, science fiction or any other kind of tawdry "genre" story. No, this one is Great Literature...I guess because Cormac McCarthy wrote it and illustrious critics (even Oprah!) liked it. So I bought it for a buck, and even did an informal poll of the Twitterati about it yesterday, getting responses that split about evenly between "love it," and "it's not that great." If we were going to die you would tell me? And so on. Much of it consists of this kind of dialogue-only interaction between the two main characters, known only as "the man" and "the boy" as they make their slow and dangerous way on foot down the titular road, trying to get to the coast and to get further south ahead of the onset of winter. The Man and the Boy are evidently survivors of an unnamed End-of-the-World event some years earlier which seems to have killed most people and destroyed the planet's climate. They struggle to keep each other alive and moving on a path that is fraught with misfortune and horror. I guess I found it to be bleak and rather heartbreaking and quite vivid, and certainly a decent addition to the sub-genre of post-apocalyptic fiction...but is it really the big deal that the critics say it is? The reviews are positively over-the-top. Enthuses Alan Cheuse of the Chicago Tribune, “The Road is a postatomic apocalypse novel as we’ve never seen one before, a black book of wondrous paragraphs that reads as though Samuel Beckett had dared himself to outdo Harlan Ellison." Or how about this from the Village Voice: "Sci-fi divination is new for him, though, and the freshness he brings to this end-of-the-world narrative is quite stunning: It may be the saddest, most haunting book he's ever written, or that you'll ever read." [italics mine] And on and on like that go the reviews. While it's certainly a decent book, these reviews make me wonder if the reviewers have ever read anything else from the genre. A mash-up of Ellison and Beckett? Are you kidding? The most haunting book that you will ever read? Ever? Post-apocalyptic survival stories are hardly anything new to readers of sf, even if they are novelties to the "mainstream" set. Also, even lit snobs and English profs know about novels like Pat Frank's Alas, Babylon and Nevil Shute's On the Beach, which I think some readers would find to have a similar emotional power to The Road. How about Miller's A Canticle for Leibowitz or Ellison's A Boy and His Dog? I believe Stephen King, too, may have ventured into this territory with a rather (literally) weighty tome. Granted, these are all very different takes on the post-apocalypse--all very different from each other and different, too, from McCarthy's story. But it's not anywhere near a new theme, and McCarthy's book does not, in my lowly opinion, somehow "transcend" the genre by allegedly being the best of the lot. It's a decent addition to the genre, but I have to say that I am not anywhere near as blown away as the lit crit crowd was, and I really never am any time I hear about how a Serious Author has transcended a genre. Serious Literature is every bit as much a genre with its own conventions and expectations as sf, fantasy or mystery or anything else. Agreed. Other than McCarthy's occasionally haunting prose, I didn't find anything particular new or news-worthy about this one. At least it was short. The movie of it is supposed to be coming out soon, and it looks like the filmmaker's beefed up the backstory. I'll probably check it out, but I don't expect to be blown away. I have not read The Road, so I can't comment on the book. What I do find interesting and regrettable is the way that these established genre tropes are picked up periodically by 'serious writers' and the results are lauded as though something new or more legit has been created. Beyond the fact that most of any grouping of anything is mediocre, I find the works of people who are aware and unapologetic about their genre affiliations to usually trump the efforts of so-called literary efforts such as this. The Handmaid's Tale was a perfectly fine novel, but the end-all=be-all dystopian novel. No. I'm sure the same applies here. And I think a point can be made that a real understanding of the given genre can lead to depth the johnny-come-lately literary author may fail to see. Take Mieville's The City and The City, for instance. (Yes, I am plugging my latest blog post abt the book! ), where the literary author would have gone all out Kafka/Beckett on the story, with an understated tale wrought with meaning. Mieville on the otherhand, understands the genre and what our expectations are as genre readers (both of the weird tale and the mystery story) and uses those expectations against us, delivers an analysis of those expectations while at once undermining them. Bottom line, this is why self-styled literary writers or serious directors rarely deliver the SF&F goodness. They don't have enough respect for the genre to do anything other than ape its most basic forms. There is a notion among some in the literary crowd that science fiction or fantasy is silly and it has to be disguised as something else in order to be respectable. The praising of a book by critics can be a calculated slap in the face to authors they perceive as cliched genre writers. However, they fail to realize (or admit) that literary-style fiction is just as cliched and silly as straight genre fiction. But as long as they have the genres to pick on, they can say "See, this stuff is original because that stuff is cliched--and this stuff is not like that stuff!" The originality comes from a comparison only, and so it is without a logical foundation. After reading many of these types of books over the years, I find Stephen King's the stand to be one of the best. Combining the horror of a science experiment gone wrong with Judeo-Christian mythology was an intriguing premise. Yeah, THE STAND is really terrific. I sort of lost track of King in more recent years (like during this decade and the last), but those earlier novels like the STAND were pretty great. He has also had a lot of short-form and novella-length fiction that's really good. Anyone read Robert McCammon's Swan Song: a direct ape of The Stand, but I always thought it held togather better and didn't have the literal god intervention at the end. Also, Mieville's novella The Tain is great. I read THE ROAD earlier this year when someone gave it to me. I have read a lot in the post-holocaust subgenre. I did not find anything special in this book. It contained NOTHING that I have not see before in the works of others. As a reader and writer I also believe in clean, clear style, so the lack of punctuation and complete sentences irritated me enough that I almost did not finish it. What is so literary about not being grammatical? I think all of these were better, and any of them show that McCarthy just found an outlet for something dark and broody (which people think is synonymous for "literary" for his next "masterpiece." I found NO element in THE ROAD that was not to be found in AT LEAST one of these earlier and better books.